Sporadic arteriovenous malformations of the brain, which are morphologically abnormal connections between arteries and veins in the brain vasculature, are a leading cause of hemorrhagic stroke in young adults and children. The underlying cause of sporadic arteriovenous malformations of the brain is unknown, but similar lesions are found in rare genetic syndromes, such as hereditary hemorrhagic telangiectasias and and in the capillary malformation—arteriovenous malformation syndrome. An international team of scientists led by those at the University of Geneva (Geneva, Switzerland; www.unige.ch), used exome sequencing and/or droplet digital polymerase chain reaction (ddPCR) to search for recurrent mutations in brain samples from dozens of individuals with sporadic arteriovenous malformations of the brain, a condition that can increase a child’s hemorrhagic stroke risk. Across the 72 cases considered in the discovery and validation stages of the study, they identified somatic KRAS mutations in 45 individuals. The team obtained freshly resected tissue samples of arteriovenous malformations of the brain or control samples of normal tissue from temporal lobectomy specimens. Endothelial-cell cultures were established and were enriched and depleted with the use of anti-CD31 magnetic beads. Cell cultures were isolated from freshly resected tissue. Frozen tissues were used for exome sequencing and ddPCR assays. 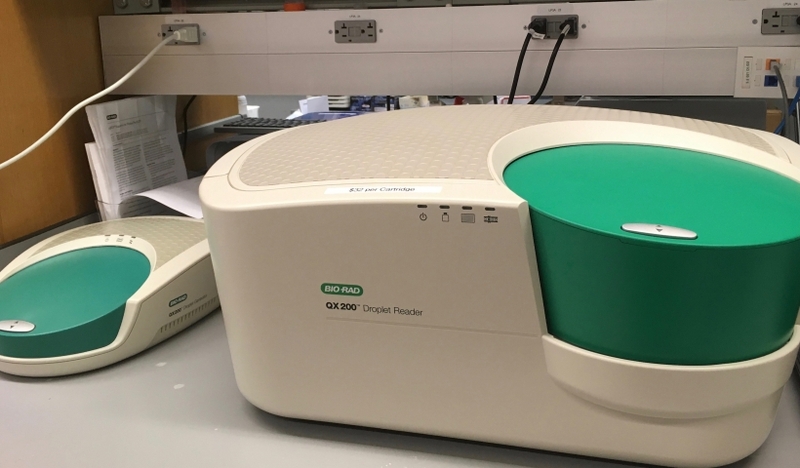 Detection of rare variants in KRAS was performed on the 0X200 Droplet Digital PCR system (Bio-Rad Laboratories, Inc., Hercules, CA, USA; www.bio-rad.com). The cell cultures were used for the ddPCR assays and Western blotting. The investigators also tested matched normal blood samples from 17 of those patients and used ddPCR to find and verify mutations in all 39 arteriovenous malformation cases in their discovery group. A dozen of the exome-sequenced malformation samples contained activating KRAS mutations not found in matched normal samples, the team reported, while ddPCR unearthed six KRAS mutations missed in the malformation exomes. Eleven more KRAS mutations turned up in malformation samples tested by ddPCR alone. They detected KRAS mutations by ddPCR that were not found in post-mortem samples from individuals who experienced other vascular malformations in the brain or central nervous syndrome. Nearly half of the arteriovenous malformations in the validation set (48%) contained suspicious KRAS variants. The authors concluded that their findings of increased MAPK-ERK signaling in endothelial cells from arteriovenous malformations of the brain without a KRAS variant suggests that activation of the MAPK-ERK pathway may be a defining feature of arteriovenous malformations of the brain. In the absence of available direct pharmacologic inhibitors of KRAS, small-molecule mitogen-activated protein kinase enzymes (MEK) inhibitors, which are used in clinical practice for treating cancers, represent candidates for testing in clinical trials to treat arteriovenous malformations of the brain. The study was published on January 3, 2018, in the journal New England Journal of Medicine.